What does it mean to follow your bliss? The American mythologist Joseph Campbell, who coined the phrase, advised us to live life authentically and joyfully and assured us that if we did that, all else would fall into place. In my own life, that has meant that I had to give up such tight control of what I thought I wanted because when I have gotten it, whatever it may be, I’ve usually been no happier than I was before. Following my bliss has had more to do with turning off the control switch and watching the inner wisdom that shows up consistently in my dreams, synchronicities and visions. Once these gems of the unconscious become conscious; they can then be incorporated into my life to see what sparks a sense of joy or calling. Learning to draw upon the living waters of spirit to move Life to where it longs to be expressed is, in my opinion, the sole reason we are here. I recently had what I consider to be a Big—from the other world that feeds this tangible world—Dream about a tree that was followed by a couple of extraordinary meaningful coincidences. In honor of Martin Prechtel’s sentiments, I will share the beauty of the dream with you now. I had this dream the night before I was to visit my doctor with a physical concern I thought might have been serious. Upon awakening, I remembered that my husband, who died at the age of 42 of cancer, had experienced tree dreams at the end of his life. However, in those dreams, the trees were all cut down, leaving only stumps. I did not try to interpret my own dream right away but felt, instead, the sense of wholeness it brought to me and a feeling that all would be well with my health (this turned out to be true) since the tree was both in movement and well-rooted and whole without the possibility of being cut down at the end of the dream. Later that week, I felt inspired to paint parts of the dream. After I finished the painting that included the dream tree with my dream self in its branches, I noticed that in its bent-over position as it walked with me, the tree looked like the Native American Trickster fertility god, Kokopeli. The painting immediately brought to mind my affinity for the Kokopeli icon, of which I have many, as well as my love of the Santa Fe/Taos Area of New Mexico. Images of Kokopeli bent over playing his flute are plentiful throughout that area of New Mexico—in silver and turquoise jewelry, statues, paintings, cloth art, pottery, and other expressive mediums. The morning after I’d completed the painting, a woman I know called to see if I’d be interested in attending a memorial for a mutual friend of ours who had died a few months earlier. The memorial, that would include scattering part of our friend Selina’s ashes, was to be conducted in the Sangre de Cristo mountain range just outside of Santa Fe, in a little town that had been a place of spiritual power to Selina when she had lived. Interestingly, it was our joint love of that area in New Mexico that had initially drawn us together as friends when we’d worked at the same organization on the west coast of Florida several years before she had died. I wasn’t surprised to receive the call. 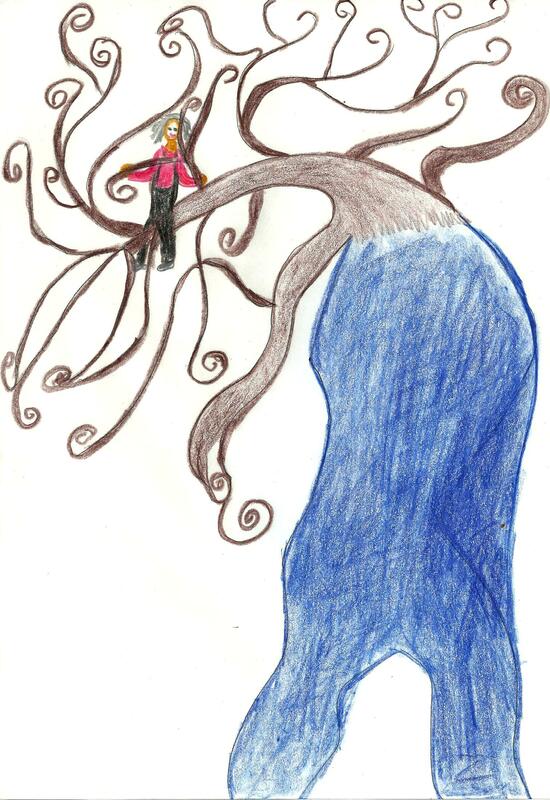 As soon as I’d noticed the resemblance of Kokopeli in the dream tree, I knew something was brewing just outside my field of consciousness that had to do with traveling to New Mexico. What I didn’t know was that there was even more to come. Thanks for the initial thoughts on the dream, Travis! I agree with you about the tree and I being one and the same. And I do feel the connection between the mythic/wildness of the dream and grounding. I am currently reading Monika Wikman’s amazing book Pregnant Darkness…much about connecting the mythic and instinctual sides of self. A few months later, I learned about a week-long retreat that Monika Wikman and Diane Haug are facilitating at the Ocamora Retreat Center in Northeastern New Mexico, located a few hours north and east of Santa Fe. The retreat, titled “Feeding the Moon: Creativity and the Divine Feminine,” will begin the day after the scheduled memorial for Selena! I didn’t personally plan these mythopoetic – as Travis would say – events. They were ‘handed’ to me, one after the other, to choose or reject. There is a saying that goes, “When the mind plans, God laughs.” My personal sequel to that is, “When God (Goddess, Great Mystery, Spirit…you choose) plans, the mind is given the opportunity to transcend all blocks to Joy.” In my experience, that is what it means to follow your bliss. Hey Jenna! I am feeling enriched and enlivened after reading your wonderful words here. Interesting that the synchronicity seems to ripple onward for me, as the piece you’ve written here calls to me and speaks helpful words at a time when I have been feeling somewhat up-rooted or ungrounded. I so appreciate the offering you’ve made here about being willing to surrender to the larger meaning and purpose and to let go and it’s inspiring me to do just that today, and to expand my own intentions to allow the natural flow to inform me and to make every effort to feed the other world with the beauty of just the kind of honoring which I understand you to be suggesting and encouraging here. Many Thanks, will be sharing this on “The Dreamng Well” too! Wonderful piece, Jenna. I just found it today. Thank you, Michelle! I just remembered to reply to your comment. Thank you for visiting, always a pleasure.